Wendy Sherman, who was the lead U.S. negotiator in the nuclear deal with Iran, was welcomed by the Institute of Politics at Harvard Kennedy School. As a resident fellow, Sherman will teach a study group on negotiation and diplomacy this semester. Secretary of State John Kerry and Energy Secretary Ernest Moniz were the most visible American figures involved in nailing down the milestone nuclear deal with Iran. But behind the scenes it was Ambassador Wendy Sherman, the lead U.S. negotiator, who spent two years hammering out an accord. As undersecretary of state for political affairs, Sherman was known as a relentless, bare-knuckled dealmaker with a no-nonsense demeanor who managed to find consensus among the complicated coalition of the United States, China, Russia, Great Britain, France, and Germany (known as P5+1) on one side of the bargaining table, and Iran on the other. The contentious deal, which freezes Iran’s nuclear program for the next 10 to 15 years in exchange for lifting international sanctions, was struck July 14 in Vienna and took effect last month. The pact marks the first time since the 1979 hostage crisis that the United States and Iran have been able to find common policy ground. Sherman retired from the State Department late last month. She now joins the Institute of Politics (IOP) at Harvard Kennedy School (HKS) as a resident fellow, where she’ll teach a study group on negotiation and diplomacy this semester. Tonight, Sherman will sit down with David Sanger ’82, national security correspondent for The New York Times and a senior fellow at the Belfer Center for Science and International Affairs at HKS, to discuss the Iran deal and its future implications. In her first interview since the landmark agreement was reached, Sherman spoke with the Gazette about how the deal came together, what went on behind the scenes, and what it takes to prevail at diplomacy. GAZETTE: What was your charge two years ago? Did you go into the talks intending to hammer out a comprehensive agreement, or did that possibility only reveal itself as things progressed? SHERMAN: The effort has always been to try to get a comprehensive agreement to ensure that Iran cannot obtain a nuclear weapon. That’s been the president’s charge forever. And in fact that was the charge even four years ago during the [Mahmoud] Ahmadinejad administration in Iran, but of course, we made no progress. The P5+1 had many a meeting; they just never got anywhere. GAZETTE: Did you go in confident this could be achieved? SHERMAN: No. We didn’t go in confident this could be achieved; we went in trying to see if it could be. The president was very clear that we had to ensure that Iran could not obtain a nuclear weapon, that we would be able to verify that its program was exclusively peaceful. And he was very clear that if we could not get there, then we could not get there. The secretary of state was equally clear. Certainly, we wanted to do this through diplomacy, but we knew that there were other options available if diplomacy was not the route to success. GAZETTE: What was the tipping point, that moment when you knew it might actually come together? SHERMAN: I think probably the first benchmark for that was the Oman channel that was led by [William] Burns, then deputy secretary of state, and Jake Sullivan, who was a deputy chief of staff and sort of the policy lead and head of policy planning for Secretary [of State Hillary] Clinton. And that I participated in, as it evolved and moved into the P5+1 channel. But that at-first-secret effort really led to the joint plan of action, which was the first step that gave us the time and space to see if we could negotiate a comprehensive agreement because it essentially froze Iran’s nuclear program and rolled it back in some significant ways. So that began, and was well developed, in that channel. I brought it into the P5+1 negotiations. It became a basis for that negotiation and for completing the joint plan of action. Once that was done, as you know, we had more than one extension of the timeline to complete a Joint Comprehensive Plan of Action, and ultimately we were able to do that this past summer. But there were many points along the way where we thought we would fail. GAZETTE: After decades of opposition, why did Iran decide to come to an agreement on its nuclear ambitions? Was it purely economics? SHERMAN: I certainly think economics and to end isolation from the international community were two of the objectives. I think that the fundamental issue here was: Would the international community agree that Iran could have a limited, highly inspected — intrusively inspected — verification and monitoring regime of a limited enrichment program? Iran never wanted to give up its [nuclear] program. They said it was for strictly peaceful purposes. Of course, the world did not believe that. Once we and the international community said yes, we could contemplate such a limited and highly monitored and verified program at a level that would ensure they wouldn’t have fissile material for a nuclear weapon, and if they would accept all those limitations — all that verification, all that monitoring — both for their enriched uranium program, their plutonium program, and our concerns about a possible covert program, in return we would, once they had completed all of those steps virtually simultaneously, lift sanctions and ultimately terminate them. That was the fundamental concept here. GAZETTE: What were the Iranians like to deal with? How did you build trust and make connections with them? SHERMAN: I don’t think any of this is built on trust. It is built on verification and monitoring. We have over three decades of mistrust. Even in a two-year negotiation, one does not overcome that. We certainly came to know each other, understand each other. During the negotiations, one of the lead negotiators for Iran became a grandfather, and I became a grandmother, and we showed each other videos of our grandchildren. So there were personal moments and human moments, but then we’d immediately go back to being quite tough with each other in the negotiations. So this is not an agreement that’s based on trust. This is an agreement based on quite detailed, specific commitments that can be monitored and verified. GAZETTE: How difficult was it to manage the varied, sometimes competing political interests within the coalition? And what was the key? SHERMAN: I think the European Union did a terrific job at coordinating this effort and this enterprise — keeping the P5+1 and the EU together. As many hours as we spent with Iranians, we spent that many hours with each other. I sometimes joke that we certainly had negotiations within our own government; we had consultations and negotiations with the Congress, with outside interests in our own country; we negotiated with our negotiating partners; and then we negotiated with Iran. And we also negotiated with interested parties around the world. So it was a very, very, very complex multilateral negotiation — multilateral in the sense within our own country, with the world, and then with Iran. But I think [the effort] was being very clear with each other about where our interests were, what mattered most to each of us, trying to find formulas that accommodated all of those interests. I think every single one of us shared the same objective, and that was to ensure that Iran could not obtain a nuclear weapon and that it could prove to the world that their program was exclusively peaceful. Those objectives drove everyone in the same direction. GAZETTE: Are there any compromises you wish could have been averted? SHERMAN: I’m probably a little too close. I know what some of the tough choices were. One always hopes for perfection. That never occurs. This is not perfect, but it does achieve the objectives that the president set out. GAZETTE: Could this deal perhaps be a template for future nuclear agreements with other nations? SHERMAN: I think every agreement is sui generis, actually. I don’t think there is any cookie cutter for these negotiations. The study group that I’ll be doing at the Institute of Politics is called “Negotiating Change: How We Took on Some of the World’s Toughest Challenges and Sometimes Succeeded.” We’re going to look at Iran, Middle East peace, North Korea, and Cuba. Obviously, we’ve done better in some than in others, and each one is quite different. GAZETTE: What did your work on the North Korea talks teach you about negotiating with governments where there is a long and deep history of mutual distrust? SHERMAN: Certainly that taught me some things. I did not negotiate the Agreed Framework [there]. That was negotiated by [Robert] Gallucci. What I negotiated with North Korea was, we were trying to get a missile-testing moratorium toward the end of the Clinton administration because if they ever had a nuclear weapon, we didn’t want them to have a delivery vehicle for it. I engaged with them quite a bit, with Madeleine Albright, then secretary of state, on her extraordinary visit [to North Korea]. I went with [William] Perry, who was the special representative for the president and the secretary of state, which I took on after him, to Pyongyang. So I went twice. I met with [North Korean leader] Kim Jong-Il. The interesting part of that negotiation is that the Agreed Framework, which Bob negotiated, was four pages long; this one is many, many, many pages long. It only dealt with plutonium; this dealt with plutonium, uranium, and covert [activities]. No additional protocol existed at the time of the North Korea agreement. That was one of the things that made it very difficult to enforce. The additional protocol was in part created because of the lack of such a mechanism for the North Korean Agreed Framework. I certainly understood that politics play a very large role in negotiations. There were opponents of the Agreed Framework. For many years during the Clinton administration, not a single additional ounce of plutonium was created in North Korea, so indeed the Agreed Framework did work for a considerable period of time. But those who did not think this was a good mechanism ultimately defeated it. North Korea was starting a secret, highly enriched uranium program at the very end of the Clinton administration, which was discovered during the beginning of the Bush administration. And because we didn’t have the mechanisms at the [International Atomic Energy Agency] to really monitor and verify to the extent necessary for these agreements, the additional protocol was created. So yes, I think not only I, but the world, learned a great deal about what is necessary, and I believe that’s evident in this agreement. 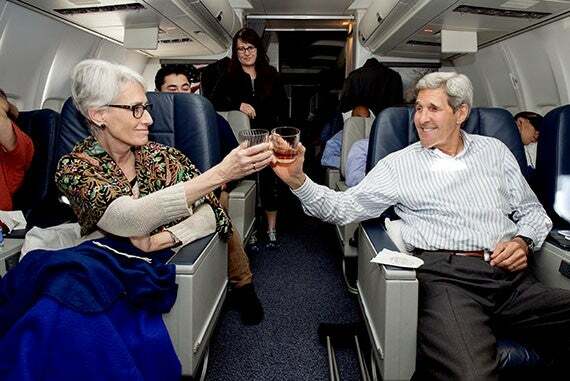 GAZETTE: There’s a photo of you clinking glasses with Secretary Kerry on the flight back from Vienna. You both look very happy. What were you feeling in that moment? SHERMAN: That was actually one singular moment of feeling like we had accomplished something that was important. We had, even before we left Vienna, begun calling members of Congress, begun calling groups in the United States interested in this agreement. We knew we were returning home to a battle royale to sustain this agreement, and so this is the only moment, in this little bubble on the airplane, that we could say “Wow, that was really something.” Secretary Moniz had taken one day away from the negotiations to go to Portugal. He’s of Portuguese descent. He was knighted in Portugal, and they gave him a bottle of Madeira wine, which he brought on board, and [he] opened that bottle, which was obviously a very special bottle, for us to toast what had occurred in Vienna. But we went immediately to work even before we got on the plane, while we were on the plane, as soon as we got back, and it wasn’t until we got to the 17th of September that anyone could take a deep breath. GAZETTE: In announcing your retirement from the State Department, you were quoted as saying that while the job has been exhilarating, it has also been a “killer.” On a personal level, what have the last four years been like for you? SHERMAN: The thing is, as the undersecretary for political affairs, my job is not just the Iran negotiations. I’m responsible for every region of the world. I’m part of the team that makes sure that our diplomats, civil servants, locally employed people are safe in our embassies. Over these four years, besides the Iran negotiation, I traveled to, I think, about 54 countries, about 97 different trips. For the Iran negotiations, the last round in Vienna, I spent 27 days in a hotel. So even while I was doing Iran, I also was keeping an eye on everything else that was going on in the world, and have been to virtually every hot spot there is — Libya, Somalia, Afghanistan, Iraq — pretty much everywhere. It is 24-7. We live in a world of BlackBerrys, as everybody knows. The State Department operations center can find me anyplace, anytime, anywhere. People live in different time zones, so you do phone calls when it’s their day, even if it’s not your day. This was the four years we also went through Mr. [Edward] Snowden; we went through Benghazi. I was on the phone with the then-assistant secretary of Near Eastern affairs, [A. Elizabeth] Beth Jones, all night long during the time of Benghazi. We evacuated all of our folks out of Libya in the middle of the night. We got all of our folks out of Syria during this time. I was also, as the secretary calls it, his wingman on the Syria [chemical weapons] negotiations, which I did with him as well. So this has been an incredible honor and privilege, but exhausting. One thing I think people do not know is that literally hundreds, thousands of people work on our behalf all over the world every day. They get up and do extraordinary things nobody knows anything about to help keep us prosperous, secure, and doing well in the world. They’re really quite amazing. I will miss my colleagues tremendously. GAZETTE: What do you hope students will take away from your time at Harvard? SHERMAN: I hope they understand how negotiations happen, how you tackle different problems, and how you have to have 360-degree vision. You have to see all around you, particularly in a multilateral negotiation. You have to see how all the pieces are on the table and how they might fit together, and if one piece moves, how you have to rearrange the rest of them — so how you put this Rubik’s Cube together of a negotiation. But also to understand that no negotiation happens just in the room in which you’re in. It happens on CNN; it happens in the United States Congress, or in the Majlis of Iran, or in the Parliament of Great Britain. It happens in the newspapers, and what you all write; it happens in how the American people experience it, and what they want as a result of it. Negotiations do not happen solely in the room; they happen in the midst of very complex politics. And if you don’t understand that interaction, you probably can’t get to a good end. President Barack Obama and Russia's President Vladimir Putin posed for members of the media before a bilateral meeting at United Nations headquarters on Sept. 28. Putin caught many off-guard during the United Nations’ General Assembly by announcing a new arrangement with Iraq, Iran, and Syria to share information in the fight against the Islamic State.